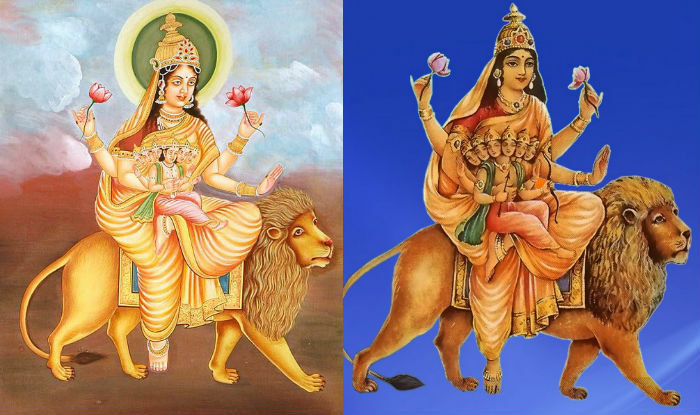 After Maa Shailaputri and Maa Brahmacharini, Goddess Chandraghanta will be worshipped on the third day of Navratri falling on September 23, 2017. The ten-day long festival of Sharad Navaratri began on September 21 and is celebrated with joy and fervour across the country. Navratri is the celebration of nine forms of Goddess Durga, the ultimate feminine power. Maa Chandraghanta is the married form of Maa Parvati after becoming Lord Shiva’s consort. In this form, Devi Parvati is peaceful and ensures the well-being of her devotees. Nevertheless, she is ready for the war with all her weapons. 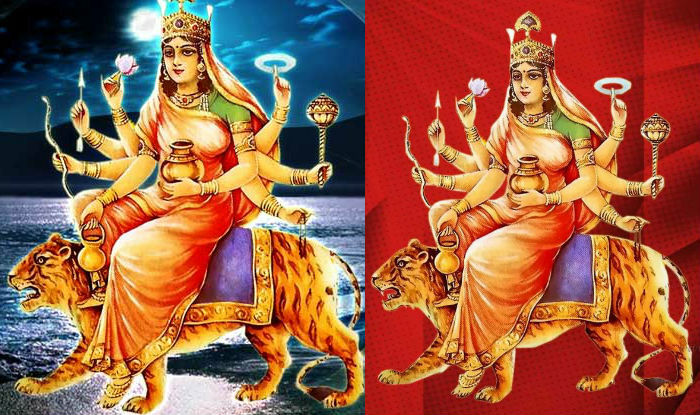 Navratri Colours 2017 With Dates: List of 9 Different Coloured Dresses to Wear During Navaratri Festival to Please Goddess Durga. The name of Goddess Chandra Ghanta means “one who has a half-moon shaped like a bell”. It is believed her “third eye is always opened and she always ready for war against demons”. This manifestation of Goddess Durga is also known as Chandrakhanda, Chandika or Rannchandi. 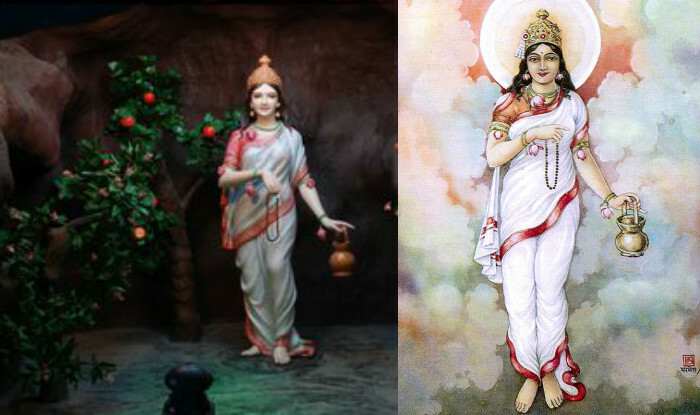 It is believed that the Shukra (Planet Venus) is governed by Goddess Chandraghanta. The devotees worshipping this avatar of Maa Durga will help them get rid of any bad effects due to Shukra. 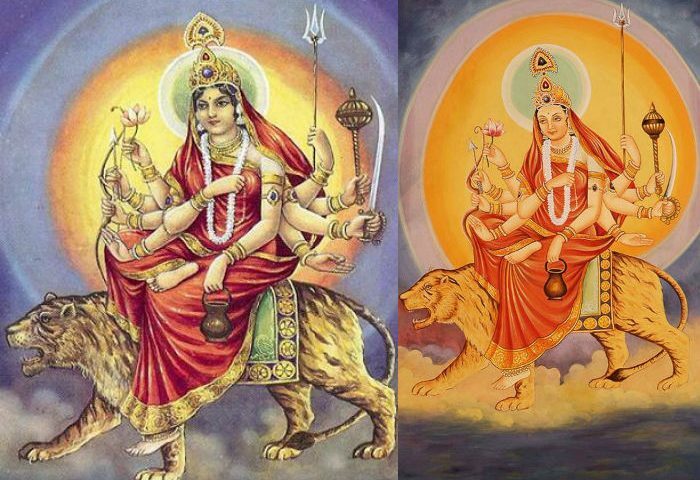 The Iconography of Devi Chandraghanta is described in religious texts as the deity mounting a tigress. She wears the semi-circular moon (Chandra) on her forehead. The half-moon on her forehead looks like the bell (Ghanta) and hence, Her name. Chandraghanta is depicted with ten hands carrying Trishul (trident), Gada, sword and kamandal (water pot) in her four left hands while keeping the fifth left hand in Varadamudra. She carries a lotus flower, arrow, Dhanush and Japa Mala (rosary) in her four right hands and keeps the fifth right hand in Abhaya Mudra. She looks after the peace and growth of her followers. It is believed that the sound of the moon-bell on her forehead drives all types of evil spirits away from devotees. The followers must offer fresh Jasmine flowers to Maa Chandraghanta while chanting the holy mantra, ॐ देवी चन्द्रघण्टायै नमः॥ Om Devi Chandraghantayai Namah. According to the Hindu legends, devotees praying to Devi Chandraghanta are blessed with grace, bravery and courage. They get free of all of their sins, distress, physical sufferings and mental griefs. © 2017 MaiharTemple. All Rights Reserved.